This certainly is true…in my humble opinion. One can choose how their heart feels, no matter the playing field. As a human, I have freedom of thought and freedom to choose how I feel about my status and environment. I can wallow in misery and defeat when life hands me lemons…or I can turn the yellow fruit into meringue pie. I can feel sorry for myself when faced with roadblocks…or I can take the scenic drive that winds past an incredible view to an awesome bike path. I can be angry over the things I have no control over…or I can take myself out to lunch with a good friend who makes me laugh and snort. I can be bitter about imperfection or I can have faith that perfect is waiting for me in a heavenly world. I can be mired in muddy negativity…or I can choose to be positive and happy every day that I live and breathe. What about you, peeps? 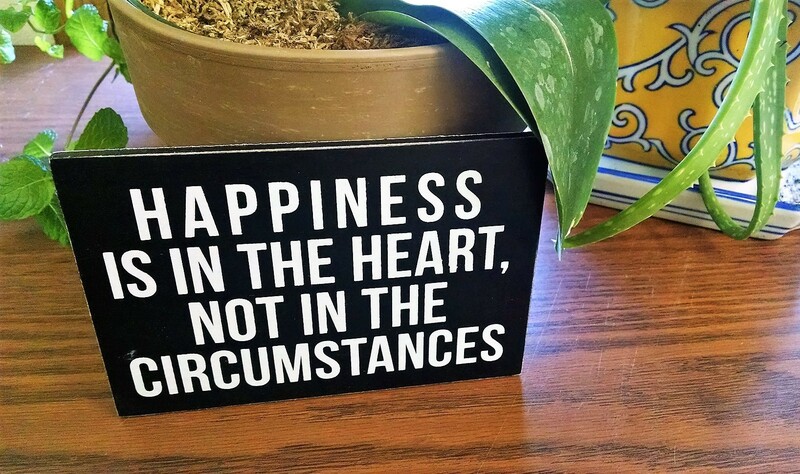 How do you look at life and your circumstances? How do you make your heart feel happy? This post has been brought to you by a positive thought process and Linda G. Hill’s “One-Liner Wednesday.” All you need to play along every Wednesday is an awesome one-liner and follow a few rules. 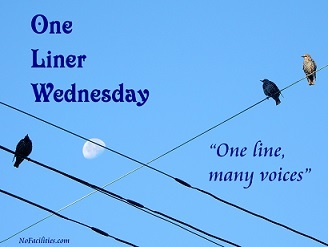 Birds on a wire are not required, but make sure you link back today’s post to HERE so the rest of us #1linerweds peeps can read it. This is my outlook as well Mary. The key to amy door is always within our grasp. Looking within offers the most revealing view. Happy Wednesday! I like that line “One can choose how their heart feels, no matter the playing field” … and the key word in there was “choose”. Today the sun is shining and I choose to spend my day with a smile 🙂 I hope your do too! I absolutely have a smile, Joanne. It’s the first day this year I rode my bike to work. The sky is blue, the sun is shining and there is no rain in sight. I just commented to Joanne that I was able to ride the bike into work today. So happy! Now, if someone would bring in lemon meringue pie, it would be a deliciously yummy day. I know. I so want pie! I’m glad to hear that you got to ride to work. And I would certainly take you up on that invitation, Judy! Life is good, Mary. No complaints from me. That’s great to hear, Lois! Excellent! Great quote! Happiness of the heart is something I can strive for… or rather, relax into. For me, it’s the underlying thoughts that affect my feelings. I ask myself, is that thought helpful? What’s another way to think about it? And then of course, BREATHE. Breathing is very important! I have a message near my work computer about breathing and letting go. It helps if I read it! I live my life, and try to get others to, in a continual golden thread of Two Choices. Get out of bed … or stay there? Have a coffee or a shower? Be miserable about having to work or happy that I get to spend time doing stuff and getting paid for it? On and on the choices go. It’s up to us to make the right choice. Then, after making that choice, we can’t moan about it because well … we chose it! Free will. Life is a series of two choices. GREAT post BikerC. Love it. It grabbed my attention and kept me reading through to the end. Fabulous read. Thanks so much for your insightful comment, Cobs. I feel blessed that I live in a country of free choice and even more so that I can happily engage free will. These are our own choices and we must take responsibility for them, but also rest easy in them. I actually have a recent draft about this very matter, not that I don’t go on about it from time to time. Happiness is a choice. Choosing to look for silver linings, to re-frame situations, to count blessings, is an essential part of living well. Stuff always happens. We don’t get to choose which bad stuff happens. We DO have choices about our reactions. It might be time to post that draft, Joey! I’ve been working on my reactions the last couple of years, mostly on the job. I had been letting stress and other people make me a little too crazy…and it was always something I had no control over. I decided that the only person suffering was me, so I’ve been trying to breathe more and let go of those situations and people. It doesn’t always work, but I’ve felt a lot calmer in recent months. This really is a choice. I may. I have to feel it, ya know? Like feel it’s the right time to share. I’m glad it’s working for you, it’s become a BIG part of my life. I do get upset when things go wrong because I am a planning person. I plan things but I can’t predict what life plans for me. I do get frustrated easily but I’m back on track in few minutes with my plan b.
It’s always good to have a Plan B, Sharukh. I tend to know where you come from in regard to planning – I tend to be a perfectionist, which means I like everything to go smoothly. When it doesn’t, that’s when I have to take a deep breath (or three or four) and go with the flow…or plan B!